I'm back! Inspiration struck...and stuck! I'll often think up a manicure, love it in my head, and then as soon as I sit in my polishing chair, hate it or try to think of something else. I don't know why I psyche myself out like that, but it'll often result in a poorly thought out or poorly executed design. Not tonight! Tonight...we've struck gold! White gold! I wanted to use my new TheHungryAsian polish, Cookies & Cream. (I've decided to change the way I display polish names from being italicized to bold, for easier readability.) I took her advice and used an opaque white underneath, White On (Sally Hansen Xtreme Wear). I'm not even sure how I came up with the idea for the stripes, but they worked out perfectly! 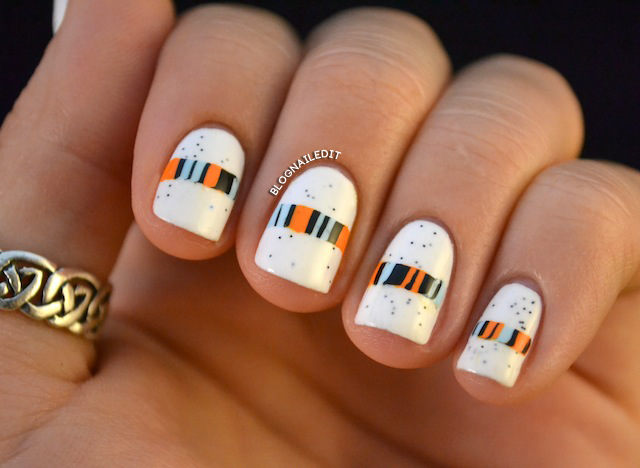 I used Light Mist (Savina), Papaya Punch (China Glaze) and my small striping brush from Color Madric, Black. I got the crisp lines using tape. Good ole tape. This is just the cutest mani--totally inspired and completely adorable! This is just so cute just love it. May I do it on my nails? OF COURSE! You never need to ask to do a manicure that you see here. If you do and blog about it, a link back to my post would be wonderful, but you never need to ask. Great. Thanks. Off to do now. Will definitely link back. This is awesome!!! These colors sooo compliment the base !